My daughter is a vegetarian, a choice she made on her own as a four-year-old. I am a vegetarian, but her father eats fish and the rare locally-grown beef. As a toddler, we let her make her own food choices, as I figured her body would tell her what healthy choices she needed. When she was old enough to realize that an animal was harmed for her food, she made the choice to join me in a vegetarian lifestyle. She was the only vegetarian in her kindergarten class. Now, her best friend has become a vegetarian and her teacher is a vegan. Thus, she was very excited to read a book about a vegetarian dragon! Eventually, Herb was rescued from execution by a little girl, who knew he was a vegetarian and not guilty. The other dragons agreed to stop eating people, and peace was brought to the forest of Nogard. My children really enjoyed this story, but I found it awkward. I think there is an attempt to show how vegetarians and meat eaters can live side by side in peace, a message of tolerance; however, the violence has caused some readers to be appalled. To tie up, tempt, and almost execute a vegetarian does not make for a very gentle and peaceful book. 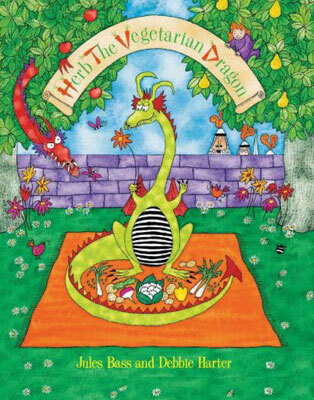 Herb, the Vegetarian Dragon has his own website! There, I discovered that the author Jules Bass has produced classic animations, such as Rudolph, the Red-Nosed Reindeer and Frosty the Snowman. The illustrator Debbie Harter is also a jewelry designer. On the website, children can send an email to Herb, get vegetarian recipes, and send greeting cards. Herb also has his very own kids’ cookbook, which may be better than his tale. Herb is a good guy, even if his story is a little awkward and violent. My daughter has been veg since the womb and there are 2 other veg kids in her 1st grade class! I kindof think it’s lame to call a veg dragon Herb and call the forest dragon spelled backwards. Not very creative in my opinion. Then again, I have lots of children’s book ideas myself and they are just sitting around in notebooks and I’m not spreading any important messages, so kudos to Jules and Debbie! My children and I love the Herb story! Jules Bass (who is a vegetarian himself) has a “cheeky” style of humor that is apparent in his other works. Think about how irreverent some of the actions and comments are in those holiday specials. I am very intrigued by Jennifer’s comment that this book is not gentle and peaceful because like those holiday specials, I don’t think the book was intended to be that way. I think you have to take the humor not so literally and with a grain of salt – so to speak. I agree that some people will be put off by the violence, but I also see it as an opportunity to open a dialogue with my children about what is acceptable and what isn’t isn’t as well as how they feel about the actions the characters are engaged in. Sadly, there is plenty of violence in our world. Many traditional children’s stories are violent but there is a reason – it allows children to develop their emotions and responses while they sort out what is and is not appropriate. While I am certainly not showing “Saving Private Ryan” on our family movie night, I think we do our children a disservice if we shield them too much from the realities of the world. Maybe I am too “pie in the sky” but I hope that when my children grow up they will be agents of change helping to remedy the horrible things in our world because they are aware of and dissatisfied with them. I believe that this story is meant to demonstrate that our global community can get along and actually appreciate each other’s differences while learning new things from each other (think – the young dragon who wants to learn how to plant a garden). Finally, although the main character is not a Vegetarian, “The Boy Who Grew Flowers” is another Barefoot Book that teaches tolerance and acceptance in a more peaceful manner that may be more well suited for those opposed to the violence in Herb. Also, “Tenzin’s Deer” set in Tibet, is very much worth a look. Thank you for your comments and opinions Jen. After I wrote the review, I did think about the violence in fairy tales, and I do think that in some stories it does serve a purpose. I guess I felt the story was awkward and led me in different directions at different times, which confused the message, in my opinion, and the violence did not help tell the tale. I think the quote from Herb I included in the post is a little strange. I have never had a meat eater try to make me eat meat, but I have met many vegetarians, especially vegans, who are quite preachy or express disdain for meat eaters. In my experiences, it was the vegetarians who are less tolerant of the meat eaters, and I include myself in this picture. I can’t stand to be in a house where bacon has been cooked, and I let whomever’s home it is know it!